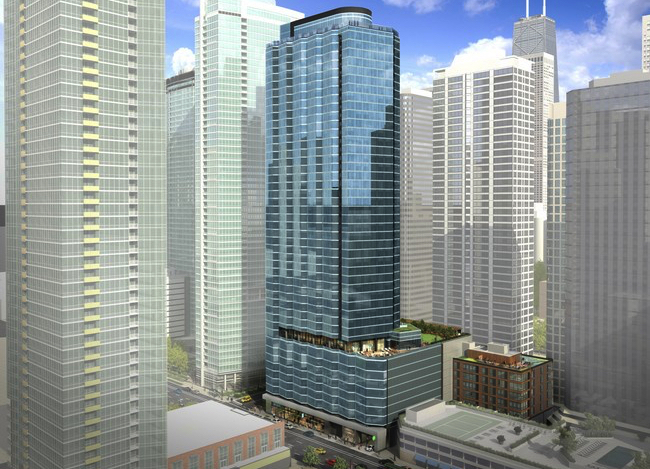 Marquee at Block 37 is a recently developed apartment tower that sits atop The Loop’s very own Block 37 shopping mall. Standing 38 stories high, the Marquee at Block 37 apartment building features a terrific blend of studio, convertible, one, two, and three bedroom apartments. As you might expect, rentals at Marquee at Block 37 are equipped with a fabulous collection of finishes and features, just some of which include wide-plank flooring, European-style cabinetry, stainless steel appliances, gorgeous quartz counters in the kitchens and bathrooms, porcelain tile backslashes in the kitchens, a full-size washer and dryer in each unit, and sprawling floor to ceiling windows that overlook the awesome cityscape that surrounds this one-of-a-kind address. As a resident at Marquee at Block 37, you’ll also be just steps from Chicago’s primary business and financial hub, not to mention all kinds of attractions and amenities like the downtown theatre district, the downtown River Walk, and of course all the fabulous parks that sit close to the city’s lake front. Check out rentals at Marquee at Block 37 or read more about the building below. The amenities list at Marquee at Block 37 is also worth mentioning, as residents here enjoy everything from a sprawling outdoor swimming pool and sundeck to a penthouse level amity floor with a fitness center and full observation deck. Once moving to Marquee at Block 37, you’ll also have full access to the CTA Red and Blue Lines, not to mention all the shopping, dining, and entertainment the Block 37 mall provides, which includes an AMC movie theater as well. For information about Marquee at Block 37, give us a call today at your earliest convenience! DIDN'T SEE ANYTHING YOU LIKE MARQUEE AT BLOCK 37? If you're finished browsing apartments for rent at Marquee at Block 37, start searching other luxury rentals in Chicago or contact The Guarnero Group at 844-SEE-CHICAGO for help with your Chicago home search!